In answer to your comments | Do you want to help create a better magazine for teen girls? As many of you following this project may have noticed, the Brainwash Project, particularly the Cleo Petition, has received a significant amount of media attention in the past few days. With articles going up on Mamamia, The Punch, The Australian, Mumbrella, BandT, Perth Now, Adelaide Now, The Daily Telegraph, The Courier Mail, Tumblr, Generation Next, 3 Hours Past the Edge Blog, News.com.au, and the Herald Sun, not to mention the flurry of activity on twitter via the hashtag #realgirlscleo, it’s been an exciting time. I’m really happy to see that so much debate about the media, girls and body image has been stimulated as a result. It’s great to see. As with all debate, there are two sides to this story. People commenting on the above linked articles and blogs have not been shy to point out their opinions and for this I thank them. Hearing what others think about these issues is really important and one of the most basic results that I hoped for when I began the Brainwash Project. Despite the overwhelming amounts of positive feedback and support that I have received, there have been a few negatives directed my way that I’ve noticed are common across many of the articles. I thought posting on my blog here would be a good way to address some of the criticisms brought out by discussion boards. NEVER EVER was I made feel insecure by photos I saw in a magazine. I was made insecure by real people. The girls in magazines were (and still are) just girls in magazines. They are not real. They are not trying to be real. THEY ARE GIRLS IN MAGAZINES. – comment on Mamamia. It’s great to see that this person recognises that girls in magazines are for the most part not real. While the person who wrote this didn’t feel affected by magazines, it doesn’t mean that the people who treated her poorly weren’t affected, or that anyone else wasn’t affected. This is a very big issue and we are talking about hundreds of thousands of girls. If one individual reader isn’t affected – that’s fantastic – but it’s not a very big objection to the cause. It’s not as if we don’t know they’ve been altered. First world problem. – comment on Mamamia. These days a lot more young girls are aware of photoshop and digital alteration and luckily a lot of parents and teachers are helping to spread the awareness. Despite this a lot of girls remain unaware exactly how much of what goes into a magazine is digitally altered and how much each individual photo is worked on and adjusted. It’s extremely important to signpost these alterations so that girls know. Even with the knowledge that images are photoshopped, it’s very easy for the images to have an effect on what one thinks about beauty and attractiveness. Subconsciously or not, a lot of us are negatively affected by the images we see in the magazines we read. As well, many girls rely on magazines like Cleo and Cosmopolitan for fashion and makeup advice. They use the images presented in the magazines as a point of comparison to their own efforts. Despite knowing that an image has likely been photoshopped, many girls feel disappointment or repeated frustration at not being able to achieve the same look as the girl in the magazine. I know this from my own past experience in high school and from the comments and feedback I’ve received from women and girls all over the country- many of them didn’t realise the images in the glossies were photoshopped at all. I’ve had this commented in various ways quite a few times and it’s a valid point – if the magazines make us as readers feel bad, why do we buy and read them? Well for many reasons. For teenage girls it’s often less a matter of whether they want to read them or not and more about whether they want to be included in the conversation their friends are having. Most teen girls tend to read similar magazines at the same time and the articles they read influence their discussion – not always of course, but it’s common. A lot of girls will read these magazines just so that they aren’t excluded. If their parents won’t buy them for them and they can’t get them with their own money then they will often just pick up a friends copy. It’s not hard to access them. Receiving gift subscriptions, reading while in waiting rooms or at supermarket checkouts are also places and ways people continue to absorb these magazines. Also, we’re creatures of habit and these magazines often affect us subconsciously – we don’t realise at the time. I read them for years before understanding how much of my skewed perceptions of beauty and health had been influenced by them. The content in these magazines commonly encourages competition between girls. By comparing two women wearing the same dress and pointing one out as a failure over the other, by running articles about how to be prettier than the bride on her wedding day, how to outsmart his ex, how to ensure he only looks at you, etc, the magazines are encouraging girls to imagine all other girls as competition. It’s not hard to find examples like this. In this day and age we should be celebrating women and encouraging friendship and support of each other. By teaching readers that they should be trying to be better than other girls, particularly in terms of appearance and in gaining the attention of boys, the magazines are fostering unhealthy attitudes towards others. I’m wish I didn’t have to bother addressing the comments that this person has made about my personal life as they know nothing about what I do or who I am, but I have had a few of these responses. I don’t blame magazines for the state of my body, but I do hold them partially responsible for the way I feel about my body. I am a size ten in a healthy weight range for my age and height and yes, I do occasionally have a muffin top, but unlike what the magazines taught me, it’s not the end of the world. Due to reading these magazines during my teens I developed worries about having ‘tuckshop lady’ or ‘jelly’ arms, ‘thunder thighs’ and the dreaded pimples. Not only were women with these never pictured in the magazines I read, but the editorial content often suggested that these were to be avoided at all costs. Magazines are often read by teenagers to help them establish their identity and to learn more about the world around them. 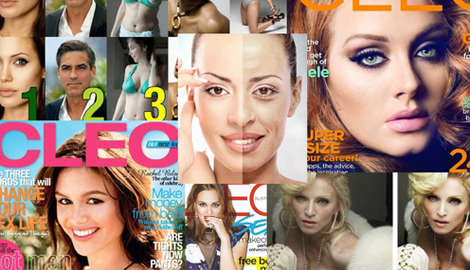 All the women they see in these magazines are airbrushed to look a certain way and readers see only one very narrow definition of beauty within the pages. Even when girls are aware that they are photoshopped, it is very easy for these images to become the face of beauty in the eyes of the readers. I think it’s about time magazines started taking responsibility for the images they present in their pages. They are powerful and they do have an effect on readers. I’m not going to address any more comments today – but if media coverage continues I’m happy to put up a few more posts like this addressing the questions and criticisms that arise. Feel free to post any questions you have about the campaign on the bottom of this article for me to answer. Well said. The commenter suggesting you just eat well and exercise clearly misses the point of your petition entirely. Women should be healthy and exercise as it’s good for you, but they should not be made to feel inferior and unhappy if they don’t reach a certain dress size. I’ve been pretty aware of the whole “Body Image Debate” for a long time, it’s a popular topic on sewing blogs and in the sewing world. Many women find that sewing helps them conquer their body image issues for two reasons- for one, you learn to dress the body you have, and for the other you start to focus your energy outward (learning better sewing techniques, building character traits like patience and perseverance, sharing through social media or local groups, etc) rather than inward (I’m not good enough, my thighs are stupid, I have the ugliest forearms in the universe, etc). I confess I’ve been a little bit cranky about the attitudes I see from some people who write about body image and the media… On one hand these types condemn the media and magazines as presenting unrealistic ideas of beauty, and on the other hand the same person is often completely rapt by hollywood doings and “fashion”…. It’s quite silly. But I really, really, really hear you about how a lot of these publications help young girls form an idea of themselves and their identities, and I should think that many teenage girls aren’t sophisticated enough to realize on their own that it’s all “make-believe.” So I think what you’re doing is great. Keep on. 🙂 And I’ll keep “flying the flag” in my own way, too. Hey StephC, I think sewing is a great outlet for women and I think it’s important that all women try to focus more energy outward rather than inward as you suggest. I think it’s ok to like fashion and to want magazines to encourage positive body image. While the two don’t always go well hand-in-hand I believe they can – they don’t have to be mutually exclusive. It’s lesser so that they’re not sophisticated enough to recognise it on their own, but that the changes made by photoshop can be subtle – while subtle they’re still not showing reality – and girls simply don’t notice. Many girls are very intelligent who don’t notice, or who do notice but don’t realise that it is having an effect on the way they think. Thanks for your support – I really appreciate it. We have to spread this message out somehow!